The World Economic Forum on Latin America 2018 is taking place in São Paulo, Brazil, on 13-15 March. The meeting will gather over 750 global and regional leaders from government, business and civil society at a decisive time for Latin America, as an intense electoral cycle over the next two years promises far-reaching political and socio-economic impacts. Here is our guide to how to follow #la18 on our digital channels, as well as how to embed individual sessions on your website. To find out how to follow our meeting on our Spanish-language channels click here. The official meeting hashtag is #la18. Follow tweets on this hashtag to keep up with everything going on in the meeting. You can also join our 5.5 million followers on http://wef.ch/facebook. We will be posting highlights from the meeting and sharing insights from key sessions. During the meeting on Latin America 2018, we will be publishing articles by participants, from CEOs and industry leaders to members of our communities - Young Global Leaders, Social Entrepreneurs and Global Shapers - on our content platform, Agenda. 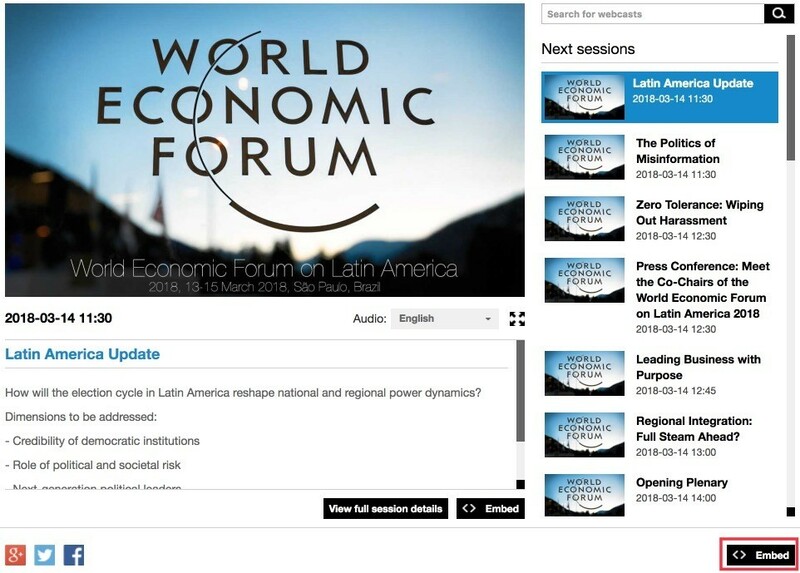 Follow our live blog of key sessions that will keep you up to date on all the key developments of our 2018 meeting on Latin America, at http://wef.ch/liveblog. You will be able to watch, embed and download many sessions, press conferences and interviews live as webcasts on http://wef.ch/la18. For a more advanced version of the embed code click on the “embed” button indicated on the previous image. Here you can configure the player for a different language interface, a different background colour, set the autoplay to on or off and choose different video-player layouts or sizes.